Starter Notes There are two routes you can take with Hel. You can have a safer start with Guardian's Blessing and Chalice of Healing or you can try to rush Book of Thoth early for extra damage. Stuke here again for another guide. Now, this guide is special to me as this is my first female, stance dancing, and magical goddess. Norsemen and women alike I bring you the Goddess of the Underworld and the ruler of the dead, Hel. Note: you don't have to follow this guide to the smallest detail, these are suggestions on how to play Hel. I encourage you to look at the comment section below and see other suggestions. Hel is a Magical, Ranged, Mage who is the first god to have stances, characters who can change the way their abilities work or a completely new kit, Hel's ability to change her stance can drastically change her play style as her "Light Stance" can make her more of a support healer while her "Dark Stance" makes her a typical damage dealer mage. So, with the right build, positioning, and good mana management, Hel can be a devastating force in the heart in her opponents. This passive might seem useless in-game, but it does a world of wonders when it's in use. In Dark Stance, you gain an additional Damage percentage. While in Light Stance, you gain additional Healing percentage. Decay is your standard forward line projectile that does AOE damage when it hits an enemy god or hits its range limit. Restoration works just like Decay but instead of damaging an opponent, it's using to heal your allies and yourself. Hinder is a ground AOE Debuff that reduces enemy Magical Protection and applies a slow. While Cleanse gives CC Immunity but note that it has some build up so time it right. Repulse is a ground AOE that has a high amount of damage. Inspire provides AOE Healing and can give a boost in Movement Speed. It does what it says on the tin, it can change your stance from Light to Dark while also giving you additional MpS for each time you level this ability up, but there's more. In Dark Stance you gain additional Magical Damage. While in Light Stance you gain additional protections. Hel needs to make full use of both her healing and AOE damage abilities during the lane phase and team fights. Building in CDR and Damage are obvious choices, but you need to get some defense items as Hel has no escape and is an easy target if caught out. - Heal, HEAL, O' SWEET BABY THOR HEAL! While Hel can put out an impressive amount of damage in the Late Game, her main goal is to keep herself and the rest of her team alive with her healing and cleansing abilities. Applying constant healing to your team hurts just as much to the enemy that applying constant damage. Anti-heals are the biggest weakness to Hel and should be avoided whenever possible. While not entirely avoidable if the enemy is smart enough to counter you, either keep those with anti-heal at a distance with your abilities or convince your team to give you a hand to deal with those threats. This combo will be on consent rotation as it will bring the pain and keep you sustain throughout the fight. Hel's Early Game is not good at all, she lacks the mana pool and regen to stay in the lane long enough without having a mana buff and potions on standby when you're too low. Get enough Mana Potion, or the Chalice of Mana, and get the Teleport Glyph relic to get back to lane as soon as possible to build up your experience and gold. To stay alive, turtle under the tower for the farm. Ward will be fine too if you don't trust your jungler to help. This is where things start to get a bit better for Hel. When you get to a certain level and get the core items online, that's when you should go on the offensive but still play it safe. Hel can snowball like no one’s business when fully built and at the max level. She would have a lot of power and sustain that will make trying to kill her a living Hell. In conclusion, Hel is a great healer god that can hit like a train in the Late Game and can be nigh unstoppable if not taken down early. Always remember to stance dance like no one’s business and keep your opponent. If you manage to master this god. You can decide to send them to Valhalla, or down to Niflheim. You can get tahuti over book (lategame), but get doom orb early instead of Book and sell doom orb late for tahuti. Can also get travellers over blue boots. 136131 Kriega1 You can get tahuti over book (lategame), but get doom orb early instead of Book and sell doom orb late for tahuti. Can also get travellers over blue boots. 135573 Stuke99 That is true. Seems like quite a bit of movement speed in your main suggested build...? Reinforced Shoes, Bumba's Mask, and Rod of Asclepius? I get that Deathwalker built it in the SPL, but he 1) had a magical solo enemy, and 2) did really well once and not well once. Bumba's seems like the weird choice here, but I dunno. Just seems really weird to me. 135513 Branmuffin17 Seems like quite a bit of movement speed in your main suggested build...? [[Reinforced shoes]], [[Bumba's Mask]], and [[Rod of Asclepius]]? I get that [[Deathwalker]] built it in the SPL, but he 1) had a magical solo enemy, and 2) did really well once and not well once. Bumba's seems like the weird choice here, but I dunno. Just seems really weird to me. When you don't have an escape, going fast isn't a bad option. Had a few games going with this build and had about 50/50 win-lose rate with it. 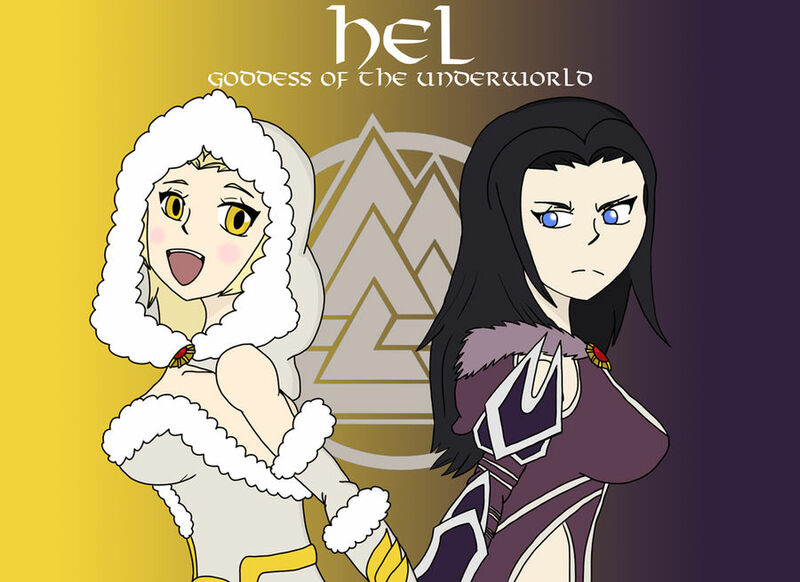 The other thing is that Hel is one of those gods that requires tons of knowledge to play to do very well with her. 135514 Stuke99 When you don't have an escape, going fast isn't a bad option. Had a few games going with this build and had about 50/50 win-lose rate with it. The other thing is that Hel is one of those gods that requires tons of knowledge to play to do very well with her. I wouldn’t say “tons of knowledge” just a basic understanding of her kit, the use of instant cast, fast reactions, good mechanics (hitting light stance 1) and efficient mana use early game. 135518 Kriega1 I wouldn’t say “tons of knowledge” just a basic understanding of her kit, the use of instant cast, fast reactions, good mechanics (hitting light stance 1) and efficient mana use early game. Look at Deathwalkers builds, he is great with Hel solo (Amazing in general but u get my point). But yeah in solo lane don't get Obsidian or deso, and don't build Asclepius third item. Core items are Book of thoth and Chronos' pendant, which both offer benefits too good to ignore. 132849 Kriega1 https://smiteprobuilds.com/?p_filters_page=1&p_filters_search=&p_filters_god=1718&p_filters_pro=~&p_filters_opponent=~&p_filters_role=Solo&p_filters_league=~&p_filters_sort=~ Look at Deathwalkers builds, he is great with Hel solo (Amazing in general but u get my point). But yeah in solo lane don't get Obsidian or deso, and don't build Asclepius third item. Core items are Book of thoth and Chronos' pendant, which both offer benefits too good to ignore. Edit: Also: https://www.youtube.com/watch?v=8oFFfJnoEjQ Edit 2: outdated advice. Is this for solo, mid, support etc... ? Also the build caps 40% cdr. 132754 Kriega1 Is this for solo, mid, support etc... ? Also the build caps 40% cdr. @Kriega: I think I'm more okay with Hel getting a full 40% CDR than most other gods. It's a complete guarantee (without spending 500 gold or taking the blue buff) for being able to ability spam and stance dance to the highest degree. @Stuke: Yeah, you definitely need to advise on mode/role. You'll probably build her a bit differently in a Support role compared to a Mid or Solo role. The build you currently have looks sort of like a mix between Support (early 3-4 items) and Mid (last 2-3 items). 132757 Branmuffin17 @Kriega: I think I'm more okay with [[Hel]] getting a full 40% CDR than most other gods. It's a complete guarantee (without spending [color=#CC9C00]500 gold[/color] or taking the blue buff) for being able to ability spam and stance dance to the highest degree. @Stuke: Yeah, you definitely need to advise on mode/role. You'll probably build her a bit differently in a Support role compared to a Mid or Solo role. The build you currently have looks sort of like a mix between Support (early 3-4 items) and Mid (last 2-3 items). I mostly write my guides for the Solo lane and Hel is best suited for that role due to her sustain but you can play her in support or mid but that's not my specialty. 132780 Stuke99 I mostly write my guides for the Solo lane and Hel is best suited for that role due to her sustain but you can play her in support or mid but that's not my specialty. Clarify that in the title if you don't mind. Also, in solo, not sure that Rod of Asclepius is the best item for her as the first item. Although it has a bit of MS, that aspect got nerfed a few patches ago, and she's going to want to level her 1 for wave clear before her 3, so the healing boost isn't going to be as high. I think rushing shoes is probably safer. Other first item options include Book of Thoth for the mana and the high power that also helps with her healing scaling, or an early protection + CDR item (e.g. BoV or Genji). 132781 Branmuffin17 Clarify that in the title if you don't mind. Also, in solo, not sure that [[Rod of Asclepius]] is the best item for her as the first item. Although it has a bit of MS, that aspect got nerfed a few patches ago, and she's going to want to level her 1 for wave clear before her 3, so the healing boost isn't going to be as high. I think rushing shoes is probably safer. Other first item options include [[Book of Thoth]] for the mana and the high power that also helps with her healing scaling, or an early protection + CDR item (e.g. BoV or Genji). In mid and solo you level the 3 at level 1. 132785 Kriega1 In mid and solo you level the 3 at level 1. What Bran said though I think the rod replaces Mage's Blessing. 132782 Gulfwulf What Bran said though I think the rod replaces [[mage's blessing]]. How do you deal with Chaacs!? They're really problematic, and not just for Hel. Aphrodite and Chang'e too. Chaac can teleport, poke you under the tower, and is very hard hitting early game while we're struggling with mana. Once I'm able to build my first item and a half it's fine, but before that it's just so hard not to feed. God forbid I get ganked. Any tips? 117613 Adfectus How do you deal with Chaacs!? They're really problematic, and not just for Hel. Aphrodite and Chang'e too. Chaac can teleport, poke you under the tower, and is very hard hitting early game while we're struggling with mana. Once I'm able to build my first item and a half it's fine, but before that it's just so hard not to feed. God forbid I get ganked. Any tips? I usually just try to poke him and make him waste his mana on his heal instead of his poke. Not the most efficient but it works....most of the time. 117628 CirclesAreRound I usually just try to poke him and make him waste his mana on his heal instead of his poke. Not the most efficient but it works....most of the time. With the changes to Hel's #1 Decay/Restoration allowing the shot to go through minions and detonating at max range would it be worth it to level that up first before Repulse/Inspire? It would allow you to keep your distance more and it's an easier poke, or is the larger heal from her #3 more important? 115600 Zugzwang01 With the changes to Hel's #1 Decay/Restoration allowing the shot to go through minions and detonating at max range would it be worth it to level that up first before Repulse/Inspire? It would allow you to keep your distance more and it's an easier poke, or is the larger heal from her #3 more important? In the Early Game she needs to sustain with the 3 in Light stance. If you don't prioritize her 3 which not only gives healing but also the bigger damage output in Dark stance then you'll lose your lane. 115601 Stuke99 In the Early Game she needs to sustain with the 3 in Light stance. If you don't prioritize her 3 which not only gives healing but also the bigger damage output in Dark stance then you'll lose your lane. If you're having trouble with a magical god and need something to combat them, take this. When you hit a threshold in your health you gain a shield that reduces you damage by half. How does the shield reduce your damage by half? And half of what? In fact, Bulwark of Hope doesn't reduce anybody's damage. I think you got something wrong there, just wanted to let you know. 115485 xZeroStrike For [[Bulwark of hope]], you say: [quote=Stuke99] If you're having trouble with a magical god and need something to combat them, take this. When you hit a threshold in your health you gain a shield that reduces you damage by half. [/quote] How does the shield reduce [b]your[/b] damage by half? And half of what? In fact, [[bulwark of hope]] doesn't reduce anybody's damage. I think you got something wrong there, just wanted to let you know. Interesting start. Seems about right. Major need for early Wards cuz you know people are going to look to gank her. Just wondering...with her Gankability or whatever, even if you're going more for damage, would Warlock's Sash be maybe a better choice? Yes, she's got some heals, but wonder if Pythagorem's Piece might still be functional for her. In a teamfight, the added utility while she looks to stay within the midst of teammates for the healing and protection might work? I don't know. Due to the price, is Chronos' Pendant still a good idea as item #4? Maybe Obsidian Shard before it in Dark Focused? Or no? If you're getting Book of Thoth (or even Warlock's Sash) you get a pretty huge mana pool. Would Mantle of Discord maybe be a better idea for her, providing balanced protections while still giving almost the same CDR and the situational stun that might give her an extra second of life? Since she's been retooled a bit, maybe talk a bit more about how she should be clearing minions in the early game, while dealing with pressure from the enemy? What should people do if enemies are mass-countering her heal? Other gameplay elements would be nice to see. Is this Solo or Mid? There's no clarification unless you read into the items. You mention getting Teleport Glyph so it's easy to guess Solo (also Solo cuz it's you). But this is important to clarify to a new reader...also, if you've got a Fenrir jungler or whatever, I think you sacrifice getting back to lane ASAP by getting Purification Beads instead. I see minor spelling errors here and there.